Banker-turned-farmer Linesh Narayan Pillai on bringing hydroponic farming to India and his efforts towards zero carbon food. The installation process includes 45-day of set-up, training and handing over of the installation. With first-hand experience in urban farming and the desire to re-introduce to the people the art of locally grown vegetables while keeping the aspects of nutrients and freshness alive, city-based Linesh Narayan Pillai poured in his expertise to give people soil-less farming. Called hydroponic farming, it is an effective way of growing leafy vegetables in small spaces without using soil. So instead of the soil, the plants are grown in a water solution that is rich in necessary nutrients. “We need locally grown food but we can’t get into farming in the city as the soil is of no good, it has got construction waste in it. You can’t truck in so much soil because there is no space to put it. The leafy vegetables available to us, be it in the mandi or high-end stores, are grown in the open fields where chemicals are sprayed. The idea is to change that format,” says the 46-year-old who first laid hands on urban agriculture in 2007 in East Europe, taking it up as a fun activity alongside his fulltime-banking job. “It came naturally to me. As it was something I did as a kid with my parents in Malad. But today, formats of farming need to change. The conventional formats aren’t working today,” he shares. When on a visit to India in 2010, he was aghast at the state of farm produces he saw lying in rucksacks in Dadar with stray animals walking over them. This further strengthened his decision to bring the farming technique to India. Finally in 2013, after successfully converting a 500 sq feet of land in Manori into a prototype soil-less farm producing 10 kgs of leafy vegetables every week, Pillai established his company Terra Farms, renamed as Urban Green Fate (UGF) Farms two years ago. “We put a net to stop all the insects from coming in. That got a lot of attention from chefs of five-star hotels and restaurants, they wanted to come and see it,” he recalls. From catering to the needs of high-end restaurants and hotels, helping corporate set-up farms under CSR and connecting with school and universities, UGF Farms is promoting zero carbon food growing in a space where it is consumed. “We have hydroponic farms and farmers who have collaborated with us and we make sure that the produce is brought to the city is from the nearest farm possible. The farm we are catering to is in Lonavla. It has got the hydroponic set up in a greenhouse and it has never been sprayed upon. The produce gets discharged from the hydroponic system and within one hour reaches the retail end. So when it goes to the store, it is a live product,” smiles Pillai who has successfully set up hydroponic farms in a couple of five-star hotels, restaurants and community spaces. The installation process includes 45-day of set-up, training and handing over of the installation. “It is a complete hand-holding process and remain there for all 45 days. Within these days, we give the entire gamut of micro greens and micro herbs. In the training session, right from what materials to be used, how to use various hydroponic media — such as expanded clay and coconut husk, from where to source the seeds, materials, etc., everything is told. There is a two-hour farm activity in the morning, wherein we do observations and corrections,” explains the urban farmer who re-visits the site when the season changes. “And, we keep a track of the farms through photos. In the morning, I am bombarded with photos of various farms. Sometimes they also send in their observation with the question and I reply straight away,” he adds. 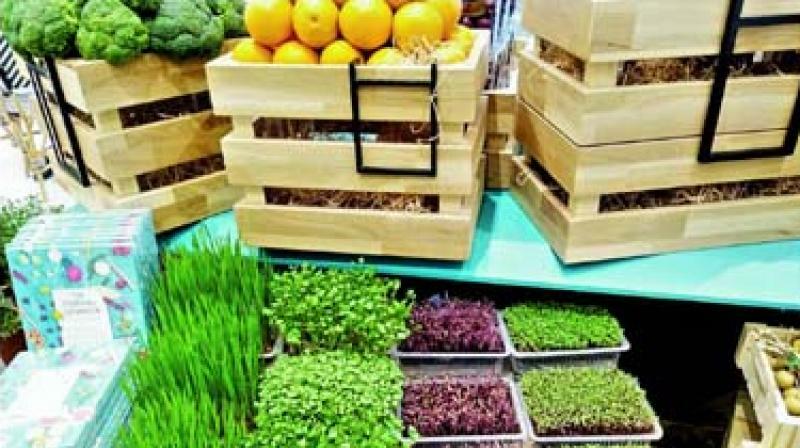 At commercial installations advocating zero carbon food, they teach a format of growing micro greens, micro herbs and leafy green vegetables in-house. “At restaurants and hotels, we do a training session with the staff that lasts about 15-20 days. During this session, we teach them how they can effortlessly grow herbs themselves,” he says. Banker-turned-farmer, Pillai also takes a session at Rachana Sansad once a year. “Wherein I connect with all the architect student and give them the message — Grow food and not lawn, because why can’t that lawn be a coriander or spinach patch?” asks Pillai. One of his innovative hydroponic set-up is at Hypercity Malad, wherein all the customer does is pluck and pay. Apart from the Foodhalls in Bandra and Palladium Mall, UGF Farms have installations in Panvel, a meditation centre in Vasind and a home for mentally challenged girls in Palghar. Talking about the easiest means of growing micro herbs at home, Pillai informs that all one on needs is a food tray. “You need a tray that is an inch deep, max 8 by 6. Top it with coir peat, take the seeds from kitchen cabinet like mustered, zeera, green peas etc. put them evenly on the try. Give them water and then place another tray underneath the tray with seeds. After that all you have to do is fill in the tray underneath with water and leave it for seven days, it will be taken care of,” he shares. With over three dozens of farms created, more than 30 installations actively growing across the city producing more than 70 tonnes of leafy vegetables, Pillai is planning something extra large. “By the end of this year, we are ready to install 25,000 sq meter multi-layer warehouse facility in Thane. You will see the farm growing at 18 levels,” he concludes.